Discover and live your purpose now. 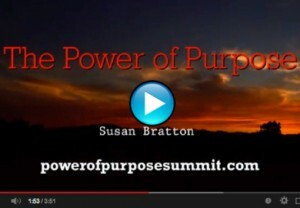 Join me and and over 25 purpose experts in the Power of Purpose Summit. 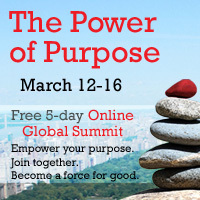 This summit is a FREE 5-day online global event that is focused on providing the tools and inspiration to help you clarify and deepen your purpose to be a force for good in the world. More than 25 purpose experts including Dan Millman, Ken Wilber, Janet Bray Attwood, Chris Attwood, Bill Plotkin, Claire Zammit, Charles Eisenstein, Tim Kelley, Amy Ahlers, John Wood and Richard Leider, will be sharing our personal stories, as well as insights, inspiration, tools, and techniques that will help you tap a new source of power, creativity, meaning and will guide you towards fully claiming and acting on your purpose. The summit is hosted by Christopher Kyle, creator of the Power of Purpose Summit, and Marci Shimoff, #1 NYT bestselling author of Happy for No Reason. Register for free here: The Power of Purpose Summit and get access to all the audio and video sessions including our 7-speaker Livestream event on March 16. Get inspired, find deeper meaning. Discover what you need more than almost anything else in your life. Let us all gather to explore the question of how to discover and fully live your purpose as an individual in a rapidly changing world. “The purpose of life is a life of purpose” – Robert Byrne.